3Designing beautiful boards and making smooth animation come naturally to us Motion Designers. It's what we're good at. However, designing the career we want, with the freedom, flexibility, and pay we crave, that's more difficult. All of the above is within your grasp if you're willing to take the plunge into freelancing. 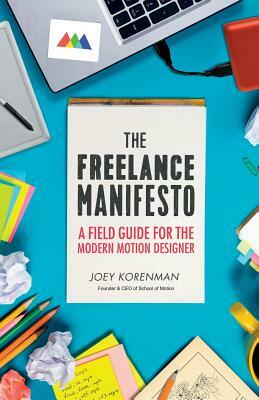 School of Motion founder Joey Korenman worked in every kind of Motion Design role before discovering that freelancing offered him not only more autonomy but also higher pay, less stress, and more creativity. Since then, he's taught hundreds of School of Motion students his playbook for becoming a six-figure freelancer. Now he shares his experience and advice on breaking out of the nine-to-five mold in this comprehensive and tactical handbook. The Freelance Manifesto offers a field guide for Motion Design professionals looking to make the leap to freelance in two clear and concise parts. The first examines the goals, benefits, myths, and realities of the freelance lifestyle, while the second provides future freelancers with a five-step guide to launching and maintaining a solo business, including making contact, selling yourself, closing the deal, being indispensable, and becoming a lucrative enterprise. If you're feeling stifled by long hours, low-paying gigs, and an unfulfilling career, make the choice to redesign yourself as a freelancer-and, with the help of this book and some hard work, reclaim your time, independence, and inspiration for yourself.